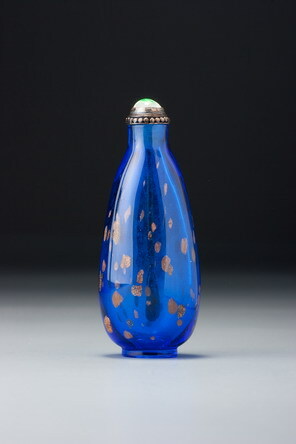 This provides us with one of the most striking examples of eighteenth-century aventurine- splashed blue glass. The exaggerated pear shape with its flared neck is an extremely elegant form, the detailing of both foot and mouth and also the polishing of the end product are impeccable, and the evenly spaced and perfectly controlled splashes impressive. It probably dates from the mid-eighteenth century, during the first half of the Qianlong reign, but may be a little later. Under magnification, the halo of olive-green colour that can appear around the edges of the gold-like spangles, where the greatest heat is felt when they are rolled into the glass body, is visible here, but it is under very good control, particularly bearing in mind how well the fragments have become part of the surface of the blue glass. When the aventurine-glass is inlaid into green glass or what appears to be black glass (but is in fact very dark green), the green halo is not visible, since it blends with the ground.